Presented as a community service by the non-profit burial grounds River View Cemetery &White Eagle Memorial Preserve in partnership with Holly Pruett, Life-Cycle Celebrant and Home Funeral Guide, with support from Passages International and the Hood River Library’s Grave Matters discussion series. David Noble, Executive Director of River View Cemetery ~ David Noble has been serving Oregon families for 43 years as a funeral director, embalmer, cemetery owner, and currently, as Executive Director of River View Cemetery in Portland. Five years ago, River View began offering the option of burial without embalming, without an outer burial container, or even without a casket, throughout the entire cemetery. 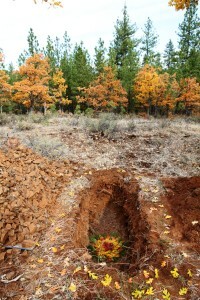 Natural burial now constitutes over 25% of River View’s burials. David is an avid supporter of green burials, as well as home funerals, and has made presentations on the merits of green burial at numerous national and local conventions of funeral directors and cemetery owners/operators. Jodie Buller, Cemetery Manager for White Eagle Memorial Preserve ~ Jodie Buller is the Cemetery Manager at White Eagle Memorial Preserve at Ekone Ranch, a Conservation Burial Ground outside Goldendale, WA. White Eagle works with funeral homes and with families directly, to offer meaningful burials in 20 acres of ponderosa and oak forest wilderness. Jodie walks people through the process of deciding their own end of life plans, and handling the logistics involved in burying loved ones. She is a celebrant and hosts burial receptions at the White Eagle cabin in the Ekone Ranch valley. Holly Pruett, Life-Cycle Celebrant & Home Funeral Guide ~ A Life-Cycle Celebrant and Home Funeral Guide, Holly works with individuals, families, and communities to create unique, personalized ceremonies from cradle to grave. As a community conversation leader, Holly has organized PDX Death Café (the largest in the world) since 2013, and was the driving force behind the 500-person conference Death:OK (Let’s Talk About It). The Natural Death Care Symposium marks the launch of her latest community education offering, theDeath Talk Project.